After three years in the making, Boring has a new way to commemorate its fallen heroes. The Boring Committee on Memorials and Remembrance will present the completed Boring Vietnam Veterans Memorial with a ceremony at 2 p.m. Friday, Sept. 21, in Boring Station Trailhead Park. 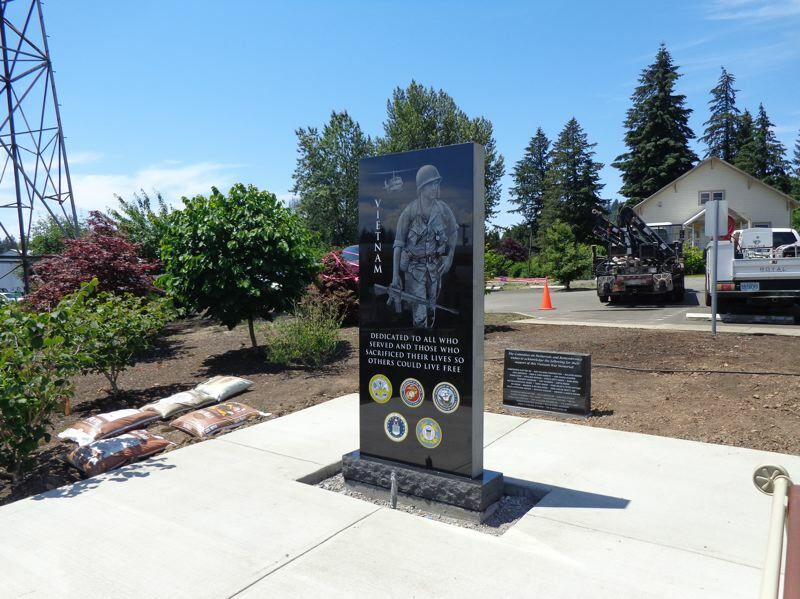 "The concept was we were going to have a landscape architect use a stone with a plaque (to commemorate Vietnam soldiers from Clackamas County)," committee Chairman Steve Bates explained. What the group has accomplished is "better than I expected ... It was nothing I did," he added. "I had a lot of help." The 7-foot high, 3-foot wide black granite monument was designed after a similar memorial created in Springfield. The memorial features the names of all 42 soldiers from Clackamas County who died during the Vietnam War, and it sits prominently in the southern portion of the park. Four of the 42 soldiers honored were from Boring. Several dignitaries are set to attend the Sept. 21 ceremony, including Clackamas County Commissioners Ken Humberston and Paul Savas. The event will include performances from local artists, such as Kelsey Hoefel, singing the National Anthem and Ron Reudi and the Hurricanes singing "Some Gave All," as well as the first-ever flying of the POW/MIA flag over Boring and much more. "I've always had an affinity for pomp and circumstance," Bates noted. As an added act of commemoration, the committee will be selling a limited number of commemorative coins, celebrating the new memorial. Each coin is $20 and the proceeds will go toward the memorial maintenance fund. "We'd like to see as many people there as possible," Bates said. There will be seating available for those who need it. "This memorial is an added benefit to the park," noted Clackamas County Parks Manager Rick Gruen. "We definitely support veterans county-wide. Everything we've added in that park was all in large part raised by the community. This is just another example of the community and the county working together to do something great out there."